The most recent Electric Daisy Carnival, held in Las Vegas June 21-23, demonstrated once again why this iconic gathering is much more than North America’s largest music festival (of any genre). Featuring some 200 EDM artists on 7 stages, alongside theatrical performers, interactive art exhibits and amusement rides, EDC’s sprawling 1,000-acre Las Vegas Speedway site was transformed into a surrealistic fantasy world with stunning state-of-the-art visual production that made the 3-day event a total immersive entertainment experience for the 345,000-plus fans who attended. 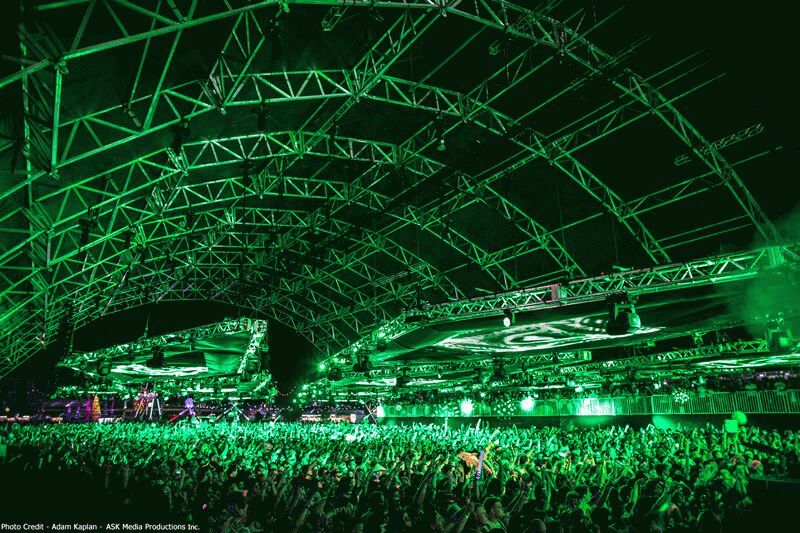 Numerous leading production specialists and lighting pros lent their talents to creating EDC Las Vegas 2013’s breathtaking audio-visual environment; one thing many of them shared in common was their choice of Elation Professional products. Five of the festival’s stages featured Elation lighting and video products, including two primary sites: the Main Stage (Kinetic Field), which was nearly three times larger than the previous year; and Circuit Grounds, topped by a massive overhead dome-like structure. The lighting on both of these stages was designed by SJ Lighting and supplied by AG Lighting, with Lighting Direction by Patrick Dierson and photography by ASK Media Productions. More than 275 Elation fixtures beamed out from Circuit Grounds, including 80 new mega-powerful Platinum Spot 35 PRO moving heads, the highest output Philips MSR Platinum lamp-powered fixture the company has introduced to date. Also making its debut on the Circuit Grounds stage was the Elation’s new Protron LED strobe, which so impressed Dierson that he proclaimed on his Facebook page, “REALLY diggin’ these new Protron LED Strobes! A lot of power in a small package and some interesting effects. These might become a new standard on my plots.” Additional Elation lights onstage at Circuit Grounds included 16 x Opti TRI 30 tri-color RGB LED par cans and 24 x DLED 60 TRI Strips. Opti TRI 30s – some 140 of them -- also turned up on the Main Stage, as did 24 x Elation Opti TRI Pars. Three of the other EDC stages also featured Elation products, including Cosmic Meadow Stage, which utilized 540 x EVLED 20mm video panels, and Bass Con Stage, illuminated by 48 x Platinum Beam 5R moving heads -- both designed by Felix Lighting. Thirty-four Platinum Beam 5Rs were also used on the Bass Pod Stage by Visions Lighting.